Doge's Palace (Palazzo Ducale) in Venice is one of the most famous and the most visited by tourists’ city attractions. The palace is located in the center of the city, on “Piazza San Marco” square. San Marco Square is visiting by all coming to Venice tourists. Doge's Palace is one of the most prominent buildings on the square. Currently in the palace is located museum. According to statistics, in 2010, the palace visited 1.36 million people. 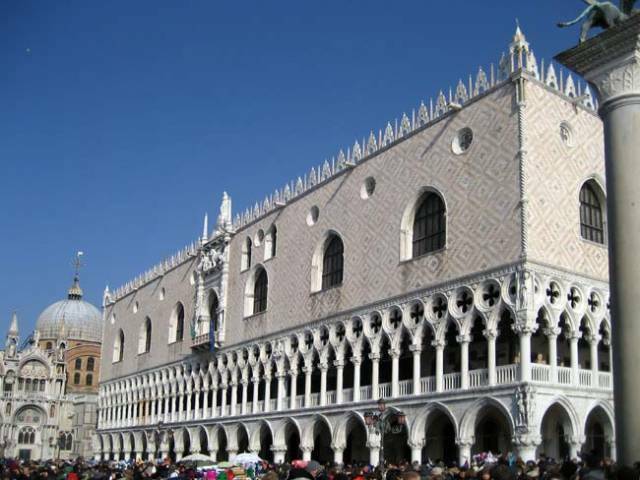 Doge's Palace in Venice is built in the Venetian Gothic style. The palace has two main fronts: one overlooking the Piazza San Marco square, the other to waterfront of the Grand Canal “Riva degli Schiavoni”. Palace construction for the rulers of Venice began in the ninth century, but the original structure is not preserved. The current palace was in the most part built between 1309 to 1424 years. For many years the palace was the residence of the Doges (the rulers of Venice). There were located also the Grand Council, Senate, Supreme Court and other agencies in the palace. At present, the palace is one of the most recognizable buildings in Venice and Italy. Near the palace also are located St. Mark's Basilica (Saint Mark's Basilica), the Clock tower.